After a few weeks speculations, Conor McGregor has confirmed that he will be fighting Nate Diaz for the rematch in UFC 200 on Saturday, 9th July 2016 in Las Vegas, USA. The fight will again take place at the 170 lbs welterweight limit similar to the weight arrangements made in their early meeting back in early March. Dana White stated while announcing the rematch that McGregor has been obsessed with the thought of a rematch since his defeat on 5th march. So UFC 200 will see McGregor headlining yet another PPV card against Nate Diaz for what will be even bigger fight than the first meeting between the two. Diaz won the earlier fight via submission but McGregor feels he is good enough to knockout Diaz in first couple of rounds this time. VENUE T-Mobile Arena in Las Vegas. TV COVERAGE UFC 200 set to be shown live in USA via PPV. While BT Sports will have live coverage in United Kingdom. Setanta will broadcast in Ireland. 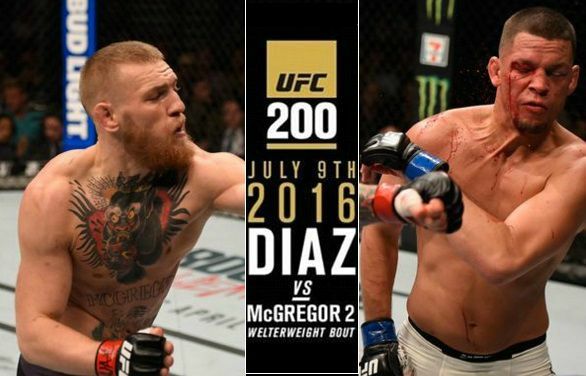 TICKETS Tickets start from $598 in lowest category for the McGregor – Diaz II. T-Mobile Arena holds capacity of around 20,000 seats. McGregor was widely tipped to go back down the weight and defend his featherweight title but he opted for what many describe as a mismatch at 170lbs weight limit against Nate Diaz who is naturally bigger and a one trick pony with his jiu-jitsu getting the better of McGregor in the first fight. Although McGregor looked to have hurt Diaz early in the fight in the first meeting but he failed to finish him off resulting in Diaz taking advantage of tired McGregor. Nate Diaz has been stubborn not to accept any weight limit lower than 170lbs and that is something McGregor will have to cope with. A 155lbs fight would be fair which will make it pretty event in terms of weight but Nate Diaz is only willing to fight MacGregor at a 170lbs.